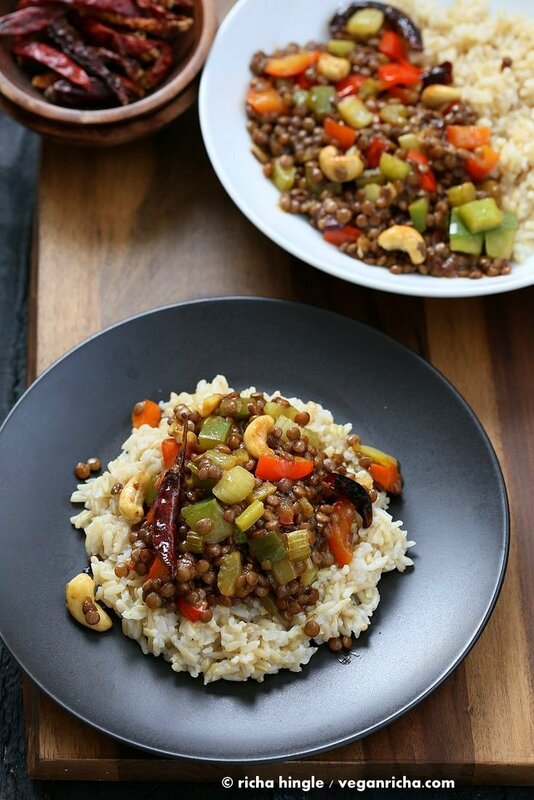 Spicy Kung Pao Lentils with a delicious kung pao sauce, veggies and cooked lentils. Easy 30 minute weeknight dinner. Gluten-free Vegan Recipe. Note: If you find lentils too earthy, double the sauce, or use other legumes like chickpeas. You knew this was coming right. 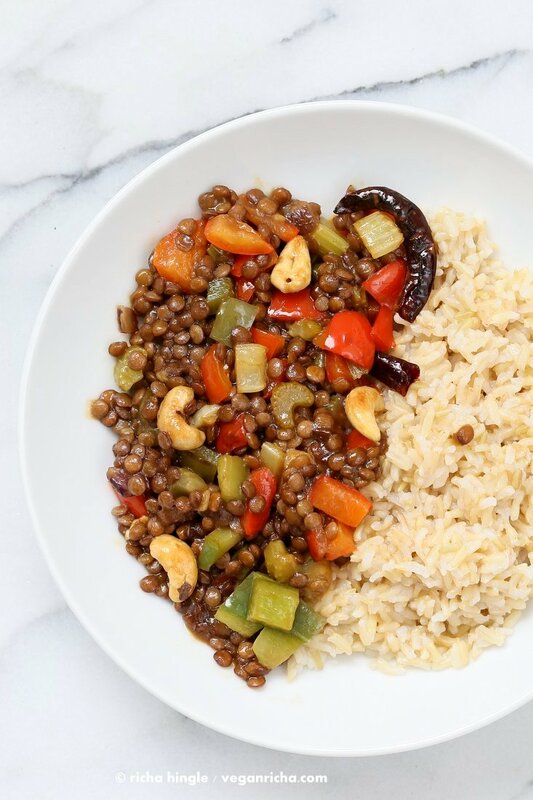 a spicy kung pao sauce and vegetables and lentils! The whole meal including the brown rice came together in like 40 minutes. The Lentils were put in their saucepan, brown rice in a pressure cooker. then I chopped up veggies, made the sauce, listened to some songs. Then when the lentils were almost done, I heated up the skillet for cooking the vegetables. While the vegetables got cooked, the lentils were ready and the brown rice was off heat and waiting on natural pressure release. Lentils and sauce cooked up for a few minutes then on the table. Spice from the whole chilies, crunchy red pepper, celery and cashews/peanuts, earthy lentils and brown rice. perfect. Use pre-cooked lentils, or other cooked beans like green mung beans, use Chickpeas! or seitan or Tofu. Add them at the step to add lentils. Use other vegetables like broccoli, snowpeas, eggplant etc. Double the sauce, add more chilies for more heat! This recipe is inspired my other popular Sweet and sour Lentils with mango. is perfect for weekday meals. More lentil recipes and asian recipes from the blog. Cook the Lentils: Combine the lentils water and salt in a saucepan. Cover and bring to a boil over medium high heat. about 6 minutes. Reduce heat to medium and cook for 20 to 25 minutes or until the lentils are tender to preference. Let the lentils sit for 5 minutes before using. Drain excess water if needed and keep aside. Or use 1 1/4 cup cooked lentils or beans. Make the sauce: combine all the ingredients under sauce into a bowl. Mix well to combine and keep aside. Cook the veggies: Heat oil in a skillet over medium-high heat. When the oil is hot, add onion and chilies and cook for 3 minutes. Add the cashews and mix for a few seconds. Add garlic and ginger and mix in. Add the peppers and celery and mix well. Cook for 3 to 4 minutes. Add in the sauce and cooked lentils and mix well. Add a few more tbsp water if you like extra sauce. Reduce heat to low and cook for 3 to 4 minutes or until the sauce thickens and some is absorbed by the lentils. Taste and adjust spice and sweet. Add red pepper flakes to taste, if needed and mix in. Garnish with a dash of lemon juice and black pepper. Serve with cooked rice or grains of choice. . I used Brown Basmati Rice with the lentils: Make it in pressure cooker. Add 1 cup washed brown rice, scant 1 1/2 cup water, a generous pinch of salt and a few drops of oil to the pressure cooker. Close the lid and cook for over medium high heat until the pressure reaches and then over low-medium heat. total 18 to 19 minutes. (1 whistle and then 13 to 14 minutes over low-medium heat). Let the pressure release naturally. Wow this looks delicious! I’m putting it on my list to try asap. Ooh now you have me craving lentils! I made this tonight. It was very tasty and easy to make. Thank you for the recipe it is a keeper. I will be making this again. I just made this, the sauce tastes amazing! Pre-cooked lentils made it super quick. I added some carrots and did peanuts instead of cashews. Kung pao tofu was always a favorite of mine but I’ve never made it myself. This is going on rotation for me. I think kung pao cauliflower would be really good too. I made a few mods, but the bones of it were this. I used coconut aminos instead of soy sauce and didn’t use any hoisin sauce (soy allergy). And I used broccoli and zucchini. But the lentils were definitely genius. Great addition. Really awesomely great idea! I am going to make this without cornstarch though. I’m going to substitute arrow root as a thickener…Corn = slow painful death to some of us. I’m new to your site and this is the first recipe I’ve tried, just tonight. Delicious sauce and dish, thank you for this gift! I’ve never cooked anything like this and I’m so happy that I can actually make Kung Pao now. Thanks for your notes on subbing ideas, too, that helped me use up some leftovers too. I didn’t have any celery so I added one cup of sliced mushrooms and used white wine instead of the sherry. It was incredible! Very flavorful and filling; my husband said I need to make it at least once a week. Thank you for another great recipe! Made this tonight for dinner with a few minor changes to keep it within my elimination diet guidelines and it was so delicious. My husband turned his nose up when I told him it was on the meatless Monday menu and he ended up loving it and having seconds! It’s definitely going into my rotation. Super creative. I made this tonight. It was super easy to make and delicious. I found the flavors to be a bit mild for my palate. Next time I will probably add a bit more salt and vinegar. It’s a keeper. This was wonderful! I didn’t have any lime so left out. I made a bit too spicy – oops! I will make again & add broccoli & carrots w/ more sauce. I served over quinoa. I’ve made this a few times now. I double the sauce and add a lot of veggies with quinoa. This is one of my favorites! I just discovered your site, and made the Kung Pao Lentil dish. Amazing!! I love the subtle lime taste. This recipe is a keeper 🙂 Thank you! I made a double-batch of this last night. very delicious! I think I may try it with tofu the next time. It is nice to learn about sauces (as with the spicy orange tofu recipe), and then I can start subbing different proteins. I made this with tofu last week (just sauteed the tofu and set aside until the end and mixed back in) and really loved it. I like it with lentils, but I will probably make it with tofu more often. Awesome! I know i like this with Tofu too! Excellent recipe!! Both hubby and I loved it!! I will be making it again! Made this tonight – major swooning. Bringing to a vegan lunch swap we do at work. Definitely in my rotation. Thanks! This was delicious, even though I lacked a few ingredients, like ginger and hoisen sauce. Definitely a keeper! Love the veganized version of a Chinese classic dish. 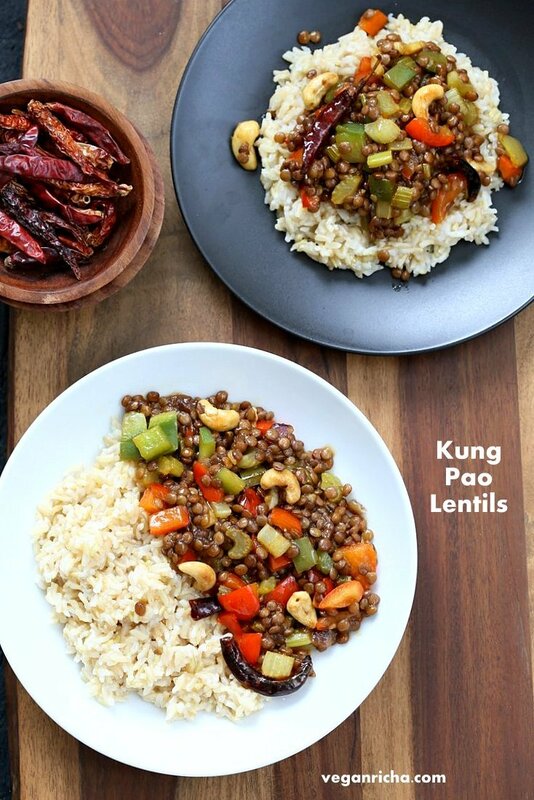 I spent 2 months backpacking through China in 2012 and while I had plenty of kung pao chicken dishes while traveling around – definitely never saw a vegan kung pao lentils on the menu. Would love to try this. Only have red lentils on hand so will give it a go with those! Awesome! red lentils cook quickly, so cook until al-dente then add to the sauce. Richa, you have outdone yourself! This meal was SO delicious! Made it tonight for a party of 4. Everyone loved it! Thank you! The photography on this recipe is so beautiful, I just must make it! But, as we have a little one, I will have to remove the “pow” factor, to make it not spicy. Looking at the rest of the ingredient list, I imagine it will still be wonderful without the heat. You can add cayenne later to your bowl, or heat up a little oil and cook red pepper flakes in it until fragrant and mix it into your helping. Made this for dinner tonight. It was super tasty, though I think next time we may kick up the heat with some chili paste. great! Yes, add some red pepper flakes to taste if needed or a few more hot red chilies. Be sure to break into half before adding for extra heat. This recipe is amazing! 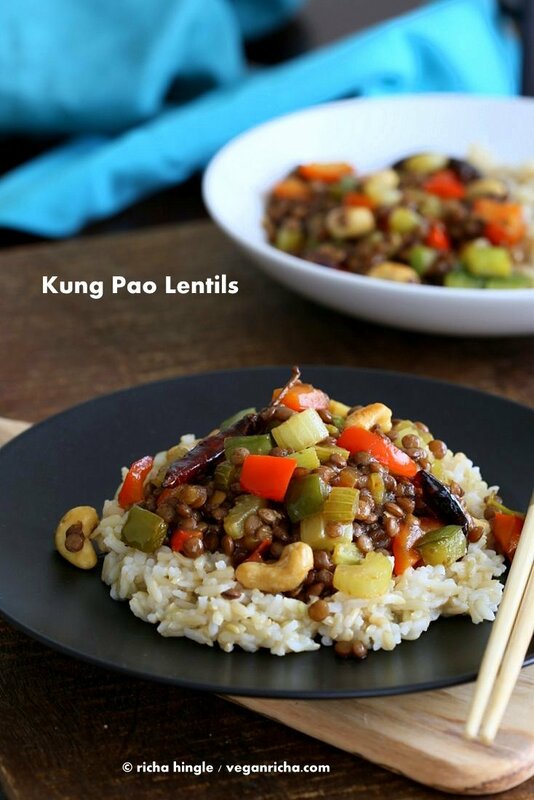 Tastes just like restaurant kung pao, and the lentils are a perfect substitute to meat. My husband, who is the ultimate meat eater (and was highly skeptical when I told him what I was making) LOVED this dish! I made this today and it was superb! I made a huge pot of lentils so I’ve got some cooked to freeze and use next time, the prep and sauce were superb and it came out well (as in spicy enough) using red chile flakes rather than the arbol peppers. Great idea and something new for the idea box! Thanks for sharing!! Made this tonight. So good! Used same amount of lentils. For the vegetables: 3 baby bok choys (leaves too), 1 whole onion (tennis ball sized), 4 carrots, 3 stalks celery, 1 package mushrooms, 1 yellow pepper. I doubled the sauce. It was great! Also plenty of left for my lunches this week. Thanks Richa! I have never cooked Kung Pao because I though it only works with chicken, but I found your recipe and tried for lunch today. OMG! It was amazing!!! I have to cook once a week at least! Thank you for sharing such a great recipe. I am a newbie (3 month) vegan and my husband is omni. This is our favourite vegan meal to enjoy together. I love making it and it freezes well if I miraculously find myself with any left overs after a couple of days. I know i will make this time and time again for many years to come. Thank you! Thats amazing! I am so glad you love it! Wow, this was delicious! Will definitely make it again and try more recipes from your blog! Cheers! This recipe is yummy I are it for my church lunch. It is very hard for me to break myself away from your fabulous Indian cookbook, but was in the mood for something different, so gave it a shot. Wow! Very good. I think you are a genius in the kitchen. The flavors were fantastic, and what an easy and inexpensive meal to put together. Thanks for the bounty! This was the first recipe that got my husband to admit that maybe lentils weren’t so bad after all. 🙂 thank you! It’s so delicious and filling! use 1 fresh red chile and 1/4 tsp pepper flakes. Taste the lentils and add more pepper flakes for heat. Made this today….this was awesome! Going in the rotation for sure! I think I added too much lime zest and it slapped me in the face …. but I liked it! I love this dish so much! I’m having company for dinner tomorrow night but we’ll be out & about all day, leaving little time for dinner prep. Do you think this recipe would work well in a slow cooker? i havent tried it in a slow cooker. Made this for supper tonight……absolutely delicious!!!!!! I made this dish and it was magnificent! I will be making it again & again. Thank you so much! I made this (several times now) and I truly loved it. Once you gather and prepare, it’s a breeze. Thank you for a lovely recipe. 🙂 Red lentils cook into a mush, which might make it look like mush food but whole lentils retain shape unless overcooked. Glad you loved it!! This was so yummy! We put them in lettuce cups for asian lettuce wraps! Thank you for the recipe! Great recipe! Added Siracha to the sauce and used fresh jalapeños instead of dried peppers! Thanks! thats awesome!! so glad you found the book and made the lentils!! This was an awesome recipe!!!! Made it exactly as written (which is really odd for me to do) only I added some chopped green onions on top. Pinned it to My Faves. Thank you so much! Hi Richa – Longtime fan, first time commenter 🙂 I want to thank you for all the hard work and care you put into your recipes. I own both cookbooks and your recipes are always, always favourites at home. The ‘awesome sauce’ way is changing my meal planning for the better! We made the kung pao lentils for dinner and they are definitely 5 star. awesome! so glad that you are loving both the books!